Inspired by the Victory Arch in Baghdad, Art theory and practice Prof. Michael Rakowitz created a smaller-scale version with a “Star Wars” spin. The hands of the piece are constructed out of pages from one of Saddam Hussein’s novels, which Rakowitz said were essentially “Star Wars” fan fiction. The entrance to “Backstroke of the West” is guarded by a behemoth of plywood with a small opening in the center. Walking through to the front of the set piece-like construct, a reverse glance reveals what the audience sees: a massive, Mesopotamian gate constructed of azure tiles. The gate is lined by a collection of ancient Babylonian artifacts and date trees, while, straight ahead, two giant hands — holding two equally giant swords — guard the room. Upon second glance, though, this Middle Eastern illusion begins to fade. The azure tiles reveal themselves to be nothing more than an array of carefully placed Pepsi packaging, the Babylonian artifacts are, in fact, constructed by food wrappers, and the swords — they’re just a couple of oversized lightsabers. This pop-infused collection is the result of over 20 years of work from Art Theory and Practice Prof. Michael Rakowitz, whose newest exhibition at the Museum of Contemporary Art features his “greatest hits” from over the years. The exhibit will run until March 4. Rakowitz collaborated with Robert Heishman (Weinberg ’12), his former graduate student, who served as the director of photography for a video presentation in the exhibit. Heishman said Rakowitz is a great partner, and respects other people’s voices and inputs. Rakowitz, an Iraqi-American artist, said he channels a lot of his background and his views on the Gulf War in his work. The largest project in “Backstroke of the West,” called “The invisible enemy should not exist,” was inspired by widespread looting in Iraq. The collection features recreations of statues and artifacts from ancient Mesopotamia that were lost or destroyed in the war. Rakowitz said the sculptures have a 3-D Monet-esque effect. From a distance, they appear to be real, ancient artifacts with worn paint and chipping edges, but on a more careful look, it’s clear each structure was created using newspapers and wrappers. 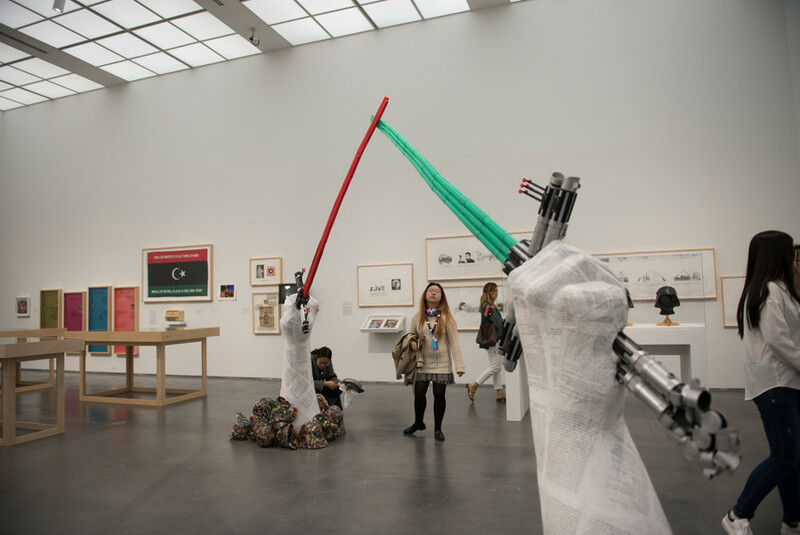 Rakowitz said the print publications he used were newspapers given to diasporic communities forced out of Iraq, and the packaging came from various foods that were often used to smuggle in Iraqi commodities. While these faux artifacts and statues traveled fairly easily to Chicago, some of the pieces were more difficult to install, Rakowitz said. “RETURN,” a living, breathing piece of art in the form of a small Brooklyn shop that sold Iraqi dates, appears in the exhibition through a video with a viewing bench flanked by Iraqi date trees in pots. Rakowitz said he chose to use Iraqi dates as the core component of this project because they have a large cultural and economic significance in Iraqi culture. Established at the height of the Gulf War, the shop was the only place in New York selling Iraqi products. As a result, Rakowitz received breaking news in 2006, just days after he closed the store. “I knew Saddam (Hussein) was going to be killed, and the only reason I knew that was because I was the only openly Iraqi business in New York at the time,” he said. In the hours before Hussein’s execution, CNN called Rakowitz for a comment, he said. He declined, and said he had to keep the news secret from everyone for 12 hours until it was broken to the rest of the world. Elements of Hussein’s influence permeate the exhibit elsewhere. Featured prominently at the center of the gallery is a collection of “Star Wars” memorabilia. Hussein was obsessed with George Lucas’ franchise, Rakowitz said. The Victory Arch in central Baghdad, which commemorates the Hussein-led Iran-Iraq War, features a pair of hands holding crossed swords echoing the iconic visual of dueling lightsabers. Rakowitz said he initially thought this was a coincidence, but further research proved it was anything but. “The night before the Gulf War began, Saddam actually had his entire army march underneath the monument to the ‘Star Wars’ theme song playing over and over and over again,” he said. Rakowitz decided to recreate the arch with a healthy dose of Jedi influence. The piece features two hands the size of golden retrievers crossing proportionally oversized lightsabers. The hands are constructed out of pages from one of Hussein’s novels, which Rakowitz said were essentially “Star Wars” fan fiction. One of these pieces is an installation that shows how an Iraqi paramilitary unit run by Hussein’s son modeled its uniforms after Darth Vader. The display features a Samurai helmet and a World War I gas mask — the inspirations for the Vader helmet — a copy of Lucas’s creation and the Fedayeen Saddam helmet that Rakowitz acquired. Rakowitz bought the helmet off eBay out of curiosity, but soon realized its artistic potential. Weinberg sophomore Chrissy Foo said she thought Rakowitz’s use of pop culture was particularly effective in shedding light on a topic that doesn’t receive a lot of recognition in the U.S.
Apart from the MCA collection, Rakowitz will also soon install a piece on the Fourth Plinth in London’s Trafalgar Square that will continue his work on “The invisible enemy should not exist,” which now includes artifacts lost or destroyed at the hands of the Islamic State. With his continuing work, Rakowitz said he wants to make it known that the war is not over, and that there continue to be negative cultural effects. “I’m trying to humanize the people who have been dehumanized,” he said.